NHS trust goes off grid for cheaper water. 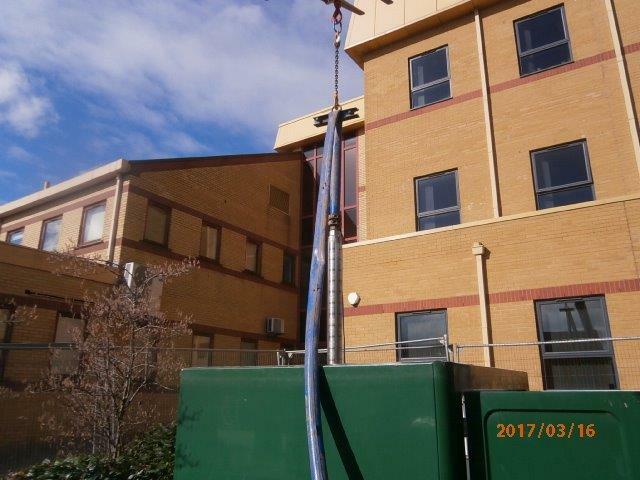 An NHS trust in the North has recently contacted a water solutions company to bring its water supply borehole on line to supply water to the whole of the hospital. Drilcorp were asked to attend site and carry out some remediation works. The borehole had been drilled many years ago but not commissioned for various reasons. The water solutions company ran the borehole to waste for a number of weeks checking the water quality. The outcome of the tests revealed that the borehole water required filtration to make it potable. The new filtration design was agreed and new units were installed to filter out minerals and organic matter. Drilcorp’s engineering division BES, removed the pump from the borehole which was suspended from a 4″ Boreline rising main. A camera survey was then carried out on the Borehole to check for casing integrity, borehole construction and stability. From the report it was identified that the borehole needed a full clean and sediment removed from the base. A bristle brush was inserted into the 12″ diameter Borehole and worked up and down the full 80m of the borehole removing sediment and rust. The brush was removed and a 4″ pipe was inserted to 1m from the borehole base. The Borehole from this point to the base was vacuumed clean, ejected water and sediment was contained in a settlement tank at surface.This water once clean was discharged down the fowl sewer and any sediment was taken away to landfill. The borehole headworks required upgrading to allow for a level transducer to be fitted. This device would be used to protect both the pump and the filtration equipment. Once the cleaning was complete a larger capacity borehole pump was installed into the borehole on the original riser. The reason for a greater capacity pump was to supply a high flow rate to the RO filtration system. The works on the borehole were completed in June 2017. BES were awarded a service contract for fifteen years to look after the Borehole. A continuity plan was put in place for any emergency callouts, meaning that in the event of a water failure BES could arrive on site with only the need of a lifting device to remove the pump from the Borehole. The remainder of the kit was stores in the pump house including the lifting chains , lifting clamps, spare cable joint kit and RAMS. All our staff had contact details of the key holders on the site. Meaning we could react quickly to an emergency call. This Borehole on average will save the NHS trust around 20% in utility bills. Another advantage is that it’s on site and the water quality via the filtration can be tailored to the hospitals own special requirements.